Since the Winnipeg International Jazz Festival kicked off this week, I wanted to recommend an appropriate book. 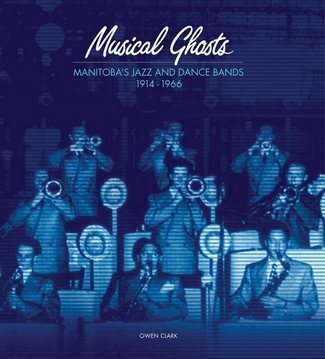 Owen Clark’s Musical Ghosts; Manitoba’s Jazz and Dance Bands, 1914-1966 is one of the few books available that describes Winnipeg’s lively popular music scene before the advent of rock and roll. Owen Clark was able to make a living as a Winnipeg based jazz and pop drummer during the 1950s and early 1960s. When musical tastes changed after the boomers fell for rock and roll, the clubs and dancehalls that he had played in either closed or converted to the new music. Clark subsequently turned to teaching and continued to play on the side. But while he was gigging, he was gathering photographs and memorabilia which now form one of the most important archival collections documenting Winnipeg popular music. It took Clark fifteen years to assemble his material, write and publish his book. The result is a unique look by an insider at the bands, musicians, bandleaders and singers who played in the numerous clubs, dancehalls and pavilions around the city and in the beach resort towns nearby. The organizing principle is also unusual. Clark walks his reader down a street and “visits” each club or dancehall on that particular street. Unfortunately, the book, which came out in 2008, is now sold out. But you can get it at the Winnipeg Public Library. There may also be a copy at one of the second hand booksellers in town. Or you can take a look at Owen Clark’s extensive collection of photographs and documentation, which he deposited in the City of Winnipeg Archives. It’s best to make an appointment before going to the archives, which you can do by phoning 204-986-5325 or emailing; archives@winnipeg.ca.